A major earthquake with a Richter magnitude of 8.1 occurred in Peru at 2033 UTC (4:33 PM EDT, 3:33 PM local time) on Saturday, June 23, 2001. The quake damaged extensively southern Peru, particularly the Arequipa-Moquegua-Tacna area. Strong ground motions were felt as far as Bolivia and northern Chile. The quake caused several landslides and generated a local destructive tsunami. A small tsunami was also observed or recorded at distant locations in the South and Central Pacific and in Japan. The epicenter of the quake was off the coast, at 16.15S 73.40W, just north of the town of Ocona in Southern Peru, aproximately 375 miles (600 km) southeast of Lima and 120 miles (190 km) west of Arequipa. Its focal depth was listed as shallow (less than 33 Km), but USGS Moment Tensor Solution gives as 9 km deep. Following the main quake, dozens of aftershocks were recorded , the largest being a magnitude 6.8. Periodic aftershocks continued in subsequent days. The distribution of initial major afterhocks is shown in the map below which also shows the approximate tsunami. generating area. According to reports, ground motions in the affected region lasted for more than a minute. The motions were so strong that even in Peru's capital, Lima (600 km away), homes collapsed and injured several people. The highest intensities were observed in the provinces of Arequipa, Moquegua and Tacna. The quake was felt strongly in many cities of Bolivia and Northern Chile. The earthquake occurred along an area of high seismicity on the west coast of Peru. It was caused from thrust faulting along the boundary where the Nazca plate subducts beneath the South American plate. This is one of the three distinct seismic zones in the Peruvian upper mantle (Ocola1966). The activity of this zone is most pronounced on the western side and lies between the Andean mountain block and the Peru-Chile Trench. This narrow seismic band (100-150 Km wide) is under Peru's Continental Shelf and is characterized by shallow earthquake activity and has great tsunamigenic potential (Pararas-Carayannis, 1968, 1974). The strong earthquake caused great damage throughout the southern region of Peru as well as in Lima. The most affected regions were the provinces of Arequipa, Moquegua and Tacna. In Arequipa and Moquegua, 80% of the homes were damaged as well as highways, water aquaducts and electrical systems. The quake practically destroyed the agricultural infastructure of this region by causing the destruction of water reseroirs, canals and bridges. Santa Rita de Sigua, the principal irrigation canal in this agricultural region, collapsed for 300 meters - closing also the Pan-American highway. The number of dead, injured and missing continued to rise in the days following the main earthquake. As of June 26, according to Peru's Civil Defense Institute, 118 people were killed, another 1,578 people were injured, 53 were unaccounted and 47,696 were left homeless. A total of 21,189 homes were damaged or completely destroyed. These represent estimates which will probably rise. Lima - Falling debris and collapsed homes injured several people in Peru's capital. Arequipa - The worst damage occurred in this historic city. Arequipa, about 465 miles south of Lima, is Peru's second largest city with population of over one million people. There were at least 73 fatalities there. The quake destroyed historic homes and cathedrals, many of which had been rebuilt after the destructive 1868 earthquake. 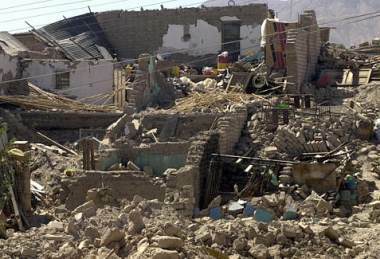 Region of Tacna - Dozens of adobe homes in the southern city of Tacna, near the border with Chile, were destroyed. Major damage occurred also in the zone known as La Yarada, where the electrical system was affected. There was extensive damage also to the irrigation aquaducts in the valleys of Sama, Locumba and Tacna. 13 people were reported killed in Tacna, and 8 people were killed in Ayacucho. Moquequa - This mining town, about 865 miles south of Lima, was also hard-hit by the quake. A landslide blocked one of the town's chief roads and many houses collapsed. 24 people were reported killed and many more were injured. Characato - This Andean highland town was extensively damaged. The last major earthquake (7.7 magnitude) to strike along the Nazca subduction zone of Peru, occurred on November 12, 1996. It killed 17 and injured about 1,500 people. On May 30, 1990, an earthquake (6.3 magnitude) in northern Peru killed 137 people. On May 31, 1970 another major earthquake (7.7 magnitude) killed approximately 70,000 people. On October 17, 1966, a strong earthquake (7.5 magnitude) off the coast of Pativilca, severely damaged Central Peru. Also, this event generated a large tsunami which caused destruction along a 400 Km long coastal belt in Peru, from Chimbote in the North to San Juan in the South - including sectors of Lima-Callao (Pararas-Carayannis, 1968, 1974). The June 23, 2001 earthquake generated a destructive, local tsunami which struck the coastline, primarily near the epicenter region in southern Peru, approximately 20 minutes after the main earthquake shock. Tsunami waves with runups ranging from10 - 15 feet or more were reported. In some coastal areas, the tsunami waves swept one to two miles inland. According to reports, 2,500 hectáreas of agricultural land were inundated in Camaná - a popular and picturesque summer resort of around 20,000, some 560 miles (900 km) south of Lima. This was one of the hardest-hit areas by both the earthquake and the tsunami. The tsunami swept more than a half-mile inland over the town and its surrounding rice and sugarcane fields. According to Peru's Civil Defense, as of June 26th, at least 20 persons were reported as drowned by the tsunami and another 60 persons as missing. These figures are expected to rise. Based on the earthquake's large magnitude, initial visual reports of a tsunami, and recordings from tide gauges in this region, the Pacific Tsunami Warning Center in Honolulu issued a Regional Tsunami warning and watch for Peru, Chile, Ecuador, Colombia, Panama, Nicaragua, El Salvador, Mexico and French Polynesia. The Tsuanami Warning and Watch was posted at 20:41 UTC, on 06/23/01. Small tsunami waves measuring a few centimeters were recorded or observed in southern and Central Pacific and as far away as Hawaii and Japan. According to the Pacific Tsunami Warning Center's Bulletin in Honolulu, the following Initial tsunami wave measurementsts were reported from tide stations in Peru and Chile. The greatest tsunami oscillation of 30cm peak to trough was recorded at Port Vila, Vanuatu, in the Southern Pacific. Additional tide gauges in the Central and South Pacific (Apia, Fanfuti, kembla, Lautoka, Lombrum, Nukualofa, Rarotonga and Suva) recorded a small tsunami. In Honolulu, Hawaii, a small influx of the tsunami was observed in the Kapalama and Nuuanu Streams, beginning at approximately 0030 hours of June 24th. The observed water movements had an apparent period of 15-20 minutes. Large earthquakes occur frequently in Peru. Major earthquakes occurred on 9 July 1586, 13 November 1655, 20 October 1687, 28 October 1746, 30 March 1828, 24 May 1940 (M=8.4), 17 October 1966 (M= 7.5), 31 May 1970 (M= 7.7), 3O May 1990 (M=6.3) and 12 November 1996 (M=7.7). Of these, the earthquakes of 1586, 1687, 1746, 1828 and 1966 produced destructive tsunamis (Iida, Cox; and Pararas-Carayannis, 1968, Pararas-Carayannis, 1968, 1974). To this list we must now add the June 23, 2001 event. The last major tsunami to strike Peru was on October 17, 1966. It affected a coastal belt 400 Km long, causing destruction from Chimbote in the North to San Juan in the South. The greatest wave at Callao had a range of 3.40 m height (range between maximum crest and trough) and tsunami waves exceeding 3 meters in amplitude (height above undisturbed water level) inundated La Punta, Chuito, Ancon, Huaura, Huacho, and the resort of Buenos Aires in the City of Trujillo. Devastating effects were experienced at the port of Casma (about 360 Km north of Lima) and at Calota Tortuga, where waves exceeded 6 meters in range. 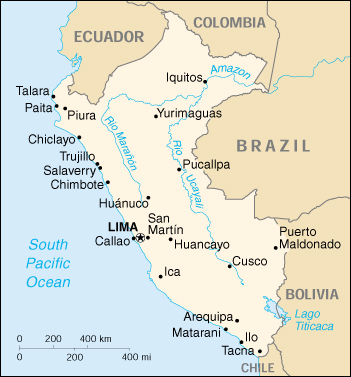 Tsunami destruction also occurred at Puerto Chimu and Culebras. The 1966 tsunami caused no damage outside Peru, but was recorded by tide gauges throughout the Pacific Ocean (Pararas-Carayannis, 1968, 1974). The azimuthal orientation (and quake faulting) of a tsunamigenic area can be determined or deduced from analysis of seismic or oceanographic data (Pararas-Carayannis, 1965,1968, 1972, 1974). Seismic data analysis: The nature of the first seismic motion related to an earthquake depends on the crustal displacement of the source. The impulse of P (compressional) waves indicates a vibration in a plane containing the great circle that passes through the epicenter and the seismic station recording an earthquake (Galitzin,1909). If the first impulse on the vertical component of the seismograph is up, the first phase of P wave is a compression, so the composition of north-south and east-west is in a direction away from the epicenter. A composition of the three components gives the direction of the first displacement of the ground, which however is not the exact direction of the path of the incident wave. It is rather the combination of the amplitudes of the incident P wave and the reflected P and S (shear) waves that give an indication of the motion of the surface of the ground. A single force sends compression waves into a half space and rarefaction waves into the other half space; a couple sends alternate compressions and rarefactions into quarter spaces (Nakano,1923). Modal planes of the focus can be deduced from recordings of compressions and rarefactions (Byerly,1955). Such a pattern can be considered a function of the azimuth to be expected from a seismic source. 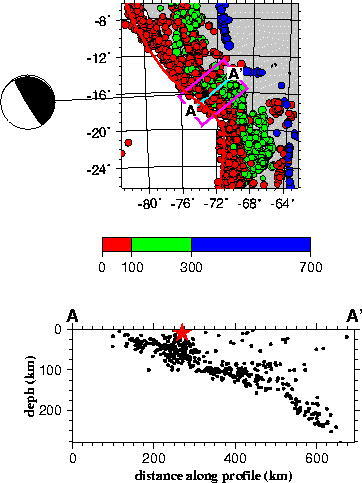 From this and the distribution of aftershocks, the tsunamigenic area can thus approximated. A projected single straight line on the map therefore, indicating the fault, should separate regions where the first motion was compression from those where it was a rarefaction, and the strike of the fault and orientation of the earthquake source region (and indirectly the tsunamigenic area) can be determined from a pattern of compressions and rarefactions. Additionally, the tsunamigenic area of an earthquake can be deduced indirectly from oceanographic parameters by refracting tsunami waves back to the source from tide gauge stations which recorded the tsunami, and for a length of time equal to the travel time to each station. Using several stations and based on water wave refraction analysis, an approximate envelop can be established giving the approximate orientation and dimensions of the tsunamigenic area (Pararas-Carayannis, 1965, 1972, 1974). A review of the earthquake aftershock distribution and the moment tensor analysis of the June 23, 2001 earthquake indicate that the fault rupture and the tsunamigenic area (an approximate ellipse), had a general trend striking at 284 degrees with a dip=7 and a slip=45. The adjacent map shows the approximate dimensions and orientation of the tsunamigenic area of the June 23, 2001 event. This tsunamigenic area may be refined as more data and tsunami wave refraction analysis is performed. The azimuthal orientation of the tsunami generating area provided here, is in agreement with the general trend of the fault systems, the Andean Mountains, and the Peru -Chile Trench in this region. The nature of first water motion observed at stations near the epicenter and consideration of the tsunami travel path, in addition to the seismic evidence, support the conclusion of a tsunami generating area having orientation which paralleled the coast - as shown in the illustration above. Crustal displacements were of a dipole nature (negative and positive) along a thrust fault approximately paralleling the Peruvian coast. The maximum vertical uplifted portion (appr. 1.8 m) was on the continental side of the rift and the downward portion ( appr. 1.8) on the oceanic side of the rift. However, these represent maximum crustal displacement values diminishing away from the rift zone. Upward, ground displacements must have also occured on land along the affected coastal area - but these remain to be determined by geological surveys. As of the writing of this report, the horizontal strike slip and the vertical dip slip for this event are not known with certainty - although the maximum vertical crustal displacement is estimated at 1.8 meters. However, statistical relationships between maximum crustal displacement and earthquake magnitude M have been compiled, and working curves have been plotted ( Wilson 1964, 1969). Although such empirically derived curves display scatter of data - possibly because of differences in the focal depth and geology of each region associated with each seismic event - a median value can be selected as being reasonable for shallow -focus tsunamigenic earthquakes. For the June 23, 2001 earthquake (M = 8.1), the median value of crustal displacement along the fault taken from such curve is = 5. 4m. If we assume an extreme ratio of strike-slip: Dip-slip, 10:3, then dip-slip, or vertical movement of the ocean floor along the fault, is estimated from the equation above to be, Z = 1.78m. Vertical displacements of the seismotectonic block responsible for tsunami generation will decay exponentially with distance normal to the fault in accordance to the elastic rebound theory ( Reid 1910). The ocean area affected by such displacements, the tsunami generating area, is an approximate ellipse in which the fault occupies the major axis. The leading tsunami waves are generated from the periphery of this area - and their arrival at nearby stations - is indicative of the initial ocean floor displacement. Maximum runup on the shore, is generally caused by the crest of the tsunami wave near the fault. Based on the above assumptions of vertical ocean floor displacements, the initial tsunami height in the generating area is estimated at a maximum of 1.5 - 1.78 meters above the undisturbed sea level. Given, therefore, the magnitude, depth, and epicenter of the earthquake, and utilizing the assumptions and empirical relationships outlined here, the runup along Southern Peru from tsunamis originating from this seismic region can be roughly approximated. Considering that the waves reaching the immediate coastline of Southern Peru had maximum runups of about 5 meters , the shoaling and resonance amplification factor on this coast for local tsunamis is estimated to be about about 8.5 times the maximum deep water value (1.78 X 8.5 = 15.13 meters). Since the earthquake of June 23, 2001 had a magnitude of 8.1, the fault length is estimated to be of about 152 kms . However, it should be emphasized that this is a rough estimate and that this particular earthquake was fairly shallow. The tsunami generating area of the June 23, 2001 earthquake can also be approximated by reverse wave refraction analysis from different tide recording stations in the immediate area (i.e Lima-Callao, San Juan, Iquique, Arica, Valparaiso, Antofagasta and possibly Honolulu, Rikitea, or Papeete). The actual arrival time of the first tsunami wave at each of these stations can be obtained from the tide gauge record and compared with the estimated travel times issued by the Pacific Tsunami Warning Center's initial Bulletin. Thus, appropriate corrections can be made and the tsunami area can be approximated on a map. The following estimates of first tsunami wave arrival were provided by the Pacific Tsunami Warning Center with its initial warning message. = 1/6(1.03)(.980)(10 raised to 3)(10 raised to 4)(.55 raised to 2)( 17,200 sq. km)= 8.99 x 10 raised to the 19 ergs. 1 erg = g cm sec . Considering that the energy of the June 23, 2001 earthquake (magnitude 8.1) was very large, the energy responsible for tsunami generation is a small fraction and is roughly estimated to be only 1/1,500 of the total energy of this event. The Peru-Chile Trench is a manifestation of very active subduction along the South American continent. Most of the destructive tsunamis along the South American coast have been generated from major, shallow earthquakes - east but in close proximity to the Peru-Chile Trench. Deeper earthquakes, along the Beniof Zone (which is quite wide and flat in this area of Southern Peru) do not produce tsunamis. Further south, the November 10, 1922 earthquake (Mt 8.7) in Northern Chile, had a rupture of about 300-450 km-long, extending from about 26.1 to 29.6 South. It generated also a Pacific-wide tsunami - although not as large as that generated by the 1877, or 1868 earthquakes. The source mechanism of tsunami generation associated with the earthquake of 23 June 2001 is inferred based only on a cursory review of some of the seismic and oceanic parameters associated with this event. a. 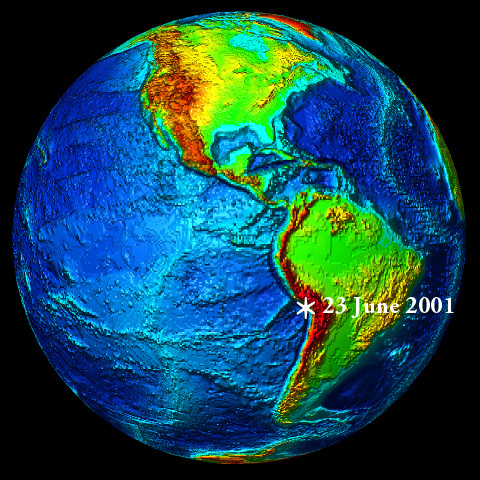 The June 23, 2001 earthquake occurred in the western part of an active seismic belt that lies between the Andean mountain block and the Peru-Chile Trench. This seismic region has been responsible for a number of major earthquakes within recorded history and local destructive tsunamis. b. The spatial distribution of aftershocks associated with the main earthquake correlate well with known seismotectonic trends and the seismic velocity structure anomalies which are characteristic of thrust fault systems at continent-ocean boundaries. c. The fault and azimuthal orientation of the tsunamigenic area were aligned with crustal displacements along a thrust fault system which parallels the Peruvian coast. Seismic and water motion data indicate that the uplifted portion of the crustal block was on the continental side of the rift. d. The tsunami was generated by displacements of a crustal block with a total area estimated at 17,200 sq. km. Its energy was calculated to be 8.9 x 10 (raised to the 19 power) ergs, or approximately 1/1,500 of the earthquake energy. e. The segment of subduction and faulting along and paralleling the Peru-Chile Trench (from about 15 to 18 South Latitude) and the obliquity of convergent tectonic plate boundaries in this region of Southern Peru , may be the reason for the shorter rupture lengths of major earthquakes and the generation of only local destructive tsunamis. However, further south (of 18 S Latitude), major earthquakes are associated with longer rupture lengths and can generate not only local, destructive tsunamis, but also destructive Pacific- wide events. Byerly, P. (1955). "Nature of Faulting as Deduced from Seismograms", Geol. Soc. Am. Spec. Paper 62, 75-86. Fisher, R. L. and Raitt, W. R. (1962). "Topography and Structure of the Peru-Chile Trench", Deep Sea Res., 9, 423-443. Galitzin, B (1909). "Zur Frage der Bestimmung des Azimuts der Epizentrums eines Bebens"; Assoc. Internat. de Sismologie, C. R. Zermatt, 1909, pp. 132-141. Gutenberg, B. and Richter, C. F. (1954). "Seismicity of the Earth" 2nd Edition, Princeton Univ. Press, Princeton, N.J., p. 310. Gutenberg, B. and Richter, C. (1956). "Earthquake Magnitude, Intensity, Energy and Acceleration", 2, Bull. Seismol. Soc. Am., 46 (2), 105-143. Pararas-Carayannis, George, and Augustine S. Furumoto (1965). "Source Mechanism Study of the Alaska Earthquake and Tsunami of 27 March 1964, Part I, Water Waves", by George Pararas-Carayannis; Part II. "Analysis of Raleigh Wave", by Augustine Furumoto, Rept. HIG65-17, 42 pp. Honolulu: Hawaii Inst. Geophys., Dec. 1965. Pararas-Carayannis, George and Calebaugh P.J., (1977). Catalog of Tsunamis in Hawaii, Revised and Updated , World Data Center A for Solid Earth Geophysics, NOAA, 78 p., March 1977. Pararas-Carayannis, G. (1972). "The Great Alaska Earthquake of 1964 Source Mechanism of the Water Waves Produced", National Academy of Sciences - Committee on the Alaska Earthquake, Volume on Seismology and Geodesy, pp. 249-258.